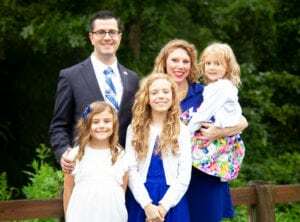 Chris and Candace Huss serve as missionaries with Armed Forces Baptist Missions reaching the sailors, coastguardsmen and families stationed at military installations in Southeastern Connecticut. As a ten-year veteran of the U.S. Navy, Chris felt burdened for the souls of those he lived and served with throughout his time in the military. Candace grew up in a Navy family, her father having served 10 years in the Navy as well. Candace understands the challenges that military wives and their families face every day and desires to support and encourage them. Seeing the great spiritual need of service members and their loved ones, Chris and Candace surrendered to the Lord to serve in the ministry in 2010. Around this time, Chris took over as director of the OverSEAers, a ministry of Community Baptist Church, filling a vacancy that had existed for several years. Since assuming this roll, Chris and Candace have been able to reach many service members with the Gospel of Jesus Christ. They joined with AFBM in 2018 after the Lord burdened their hearts with the desire to establish a Servicemen’s Center near the naval base in Groton, Connecticut. Chris grew up in a Christian home and trusted the Lord as his Savior in November 1994 while attending a church in his hometown of West Chester, PA. During his teenage years, Chris struggled to walk faithfully with the Lord, but the Holy Spirit convicted him of his need to return to a close walk with God. Like the prodigal son, Chris repented of his wanderings and became grounded in his faith through the ministry of Community Baptist Church. Candace grew up in a home where she attended Catholic services and functions. After many years of attending catechism classes, she recognized the emptiness of the works-based attempts to find favor with God. In 1996, she left the Catholic church, but she did not come to salvation until 2000. Through the faithful witness of a roommate in college, Candace trusted the Lord as her Savior in October of that year. After graduating, Candace served in her local church in Charleston, SC where she went on her first mission trip. It was in Brazil that God burdened her heart to show people in need the hope they can find in Jesus Christ alone. Chris and Candace met in August of 2005 in Charleston, SC. They were married on March 18, 2006. The Lord has blessed them with three beautiful daughters, Nevaeh, Evelynn, and Sylvia.